American Storyboard, Inc., is a non-profit, 501c3 charitable corporation dedicated to producing documentaries, plays, and other media forms of the highest quality. American Storyboard was the producer of the feature, Gloucester’s Adventure: An American Story, which won national awards, including a TELLY and GOLD AURORA, and ran on PBS outlets. American Storyboard also produced the important sports documentary, Women in American Horse Racing, which was aired on many PBS stations, notably state-wide in Kentucky. You can watch the full production on You Tube. In addition, American Storyboard has produced plays in Gloucester, MA, Boston, and New York City. (Biography.) Tax deductible donations may be made to American Storyboard, Inc., at the address below. Mission: American Storyboard seeks to improve understanding of environmental and social issues through documentaries, theater productions, and other media. Productions will improve the understanding of how factors ranging from technology to time affect our lives and values. American Storyboard seeks to help American communities and individuals face difficult decisions by deepening an awareness of historical and artistic context. American Storyboard’s first effort was Gloucester’s Adventure: An American Story, which won an Aurora Gold and a Telly in historical documentary categories. The story of a schooner, her city, and the sea, the feature had its premiere at the Peabody Essex Museum in Salem, MA, on March 1, 2002. The broadcast premiere was August 2002, on WGBH-TV, Boston’s flagship PBS station. The production was made possible by over $45,000 in grants and by in-kind contributions worth over $30,000. Copies are available at Northeast Historic Film. Praise for Adventure: “One of the last Gloucestermen to fish under sail, Adventure is a cornerstone of America’s maritime heritage. Now we can all share the saga of this fabled schooner, from fishing to windjamming and now to teaching the history and ecology of the sea. This is a wonderful story.” – Dennis Conner, America’s Cup Captain “Adventure is a defining jewel in the whole spectacle of America…” – Sen. Ted Kennedy. This documentary, co-produced by John and Sandy Ronan, explores women’s careers in racing, from trainers to vets, and from grooms to jockeys to owners. It outlines the struggle women have had – and continue to have – in their rise to prominence in the thoroughbred racing industry. 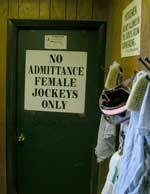 Women in American Horse Racing premiered June 16, 2007. The documentary was supported by private sponsorship and corporate underwriting, by institutional grants, and by dedicated fundraising. Active sponsors included the Autotote Corporation, a subsidiary of Scientific Games, and The Daily Racing Form. Women in American Horse Racing has been featured on PBS stations throughout Kentucky (KET) and Arkansas (AETN). Watch a clip from Women in American Horse Racing. High Horse will examine the transition between horsepower and the automobile at the turn of the twentieth century. The advantages of speed and power presented by the internal combustion engine created ‘progress’ in America and throughout the world, but at a great price – to the horse and to human sensibilities. High Horse plans to explored the gains and losses of this historic period. Pre-production will begin in 2019.